There are over 1,000 varieties of lilacs. Lilacs are edible. Please pass the lilac salad! Purple lilacs represent first love. White lilacs symbolize youthful innocence. The name "Lilac: comes from from the Persian word "lilaq", which means flower. Lilacs belong to the same family as the olive (Oleaceae). Purple colored lilac varieties have the strongest scent. Lilacs are used in soaps, perfumes and other cosmetics. Wood from the lilac trees can be used to make musical instruments, knife handles and more! 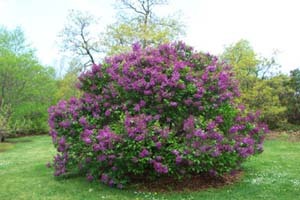 Lilacs bushes can live over 100 years. Lilacs were in George Washington and Thomas Jefferson's colonial gardens. This story is from Greek mythology: It's about a beautiful nymph named Syringa (lilac's botanical name). "Pan", the god of the forests and fields, was captivated by Syringa's beauty. Pan chased Syringa through the forests. Syringa was frightened by Pan's affections. Syringa escaped Pan by turning herself into a lilac bush.